So last week I reached 200 followers on my Instagram which I know doesn’t sound like much – but I was so excited when I started it last year to have 10 people following me!! The crafty community on Instagram is such a nice place to be. Everyone is so friendly and encouraging and I love nothing more than looking at all your wonderful photos, full of inspiration and fun ideas. 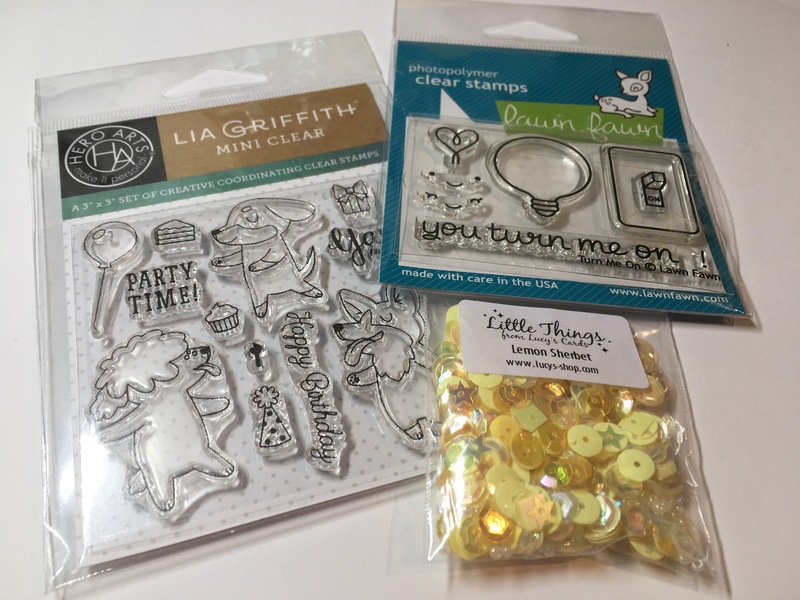 I’m giving away a Hero Arts ‘Party Time’ by Lia Griffith, a Lawn Fawn ‘Turn Me On’ stamp set and a bag of Lemon Sherbet sequin mix. To enter simply follow me on Instagram, like the post and tag a friend. For an additional optional entries- comment here on this blog post for one and like Seven Blue Rooks on Facebook. I’ll be picking a winner via raffle on Monday the 20th of February at 5pm GMT. Congratulations on your 200 followers! I was admiring the colouring you did on puppy stamps. Great variety! Thanks for the fun Giveaway! Congratulations! You are so sweet to offer a giveaway! Thank you! You’ve been entered into the raffle. Good luck! Hi Kathy, thank you so much for commenting and subbing! You’ve been entered into the raffle 😊 Good luck!